The nearer to London's city centre we work, the smaller town gardens are, yet the gamut of garden design techniques, project logistics and spatial trickery required to generate tenable outdoor functionality is indeed rather large in its breadth. Brainstorming for creative as well as effective garden design solutions forms a continual journey into urban alfresco artistry, with waning outside space, weather variability and fleeting architectural trends defining progressively smaller town gardens, where we formulate fresh landscape design ideas to produce pleasurable and exceptionally detailed small city gardens. 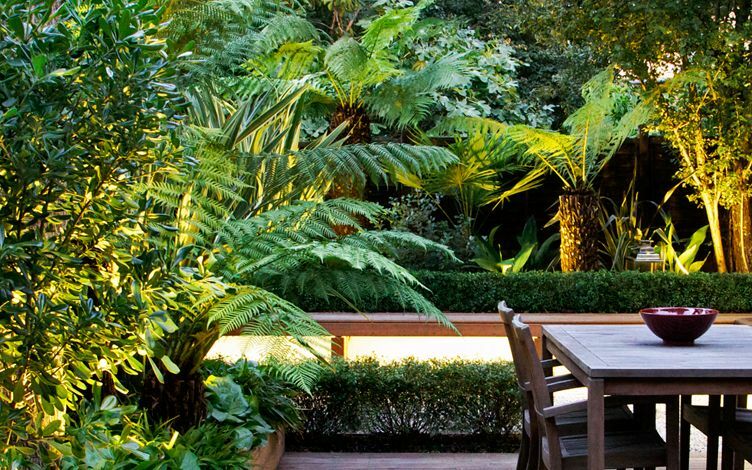 We derive inspiration from our clients' lifestyles to create practical designs for compact city gardens which are congruous with their settings – an ongoing and intricate mission, however small the town gardens we design and build may often be! How small? 80sqm. City location: London NW8. 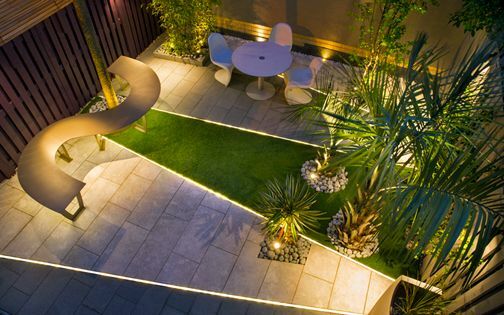 Garden: end-of-terrace plot, south-west facing with a roof garden. 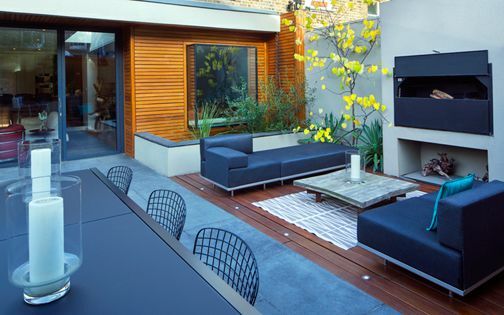 Design elements: one-off benches, Ipe decking, buff sandstone, custom planters. 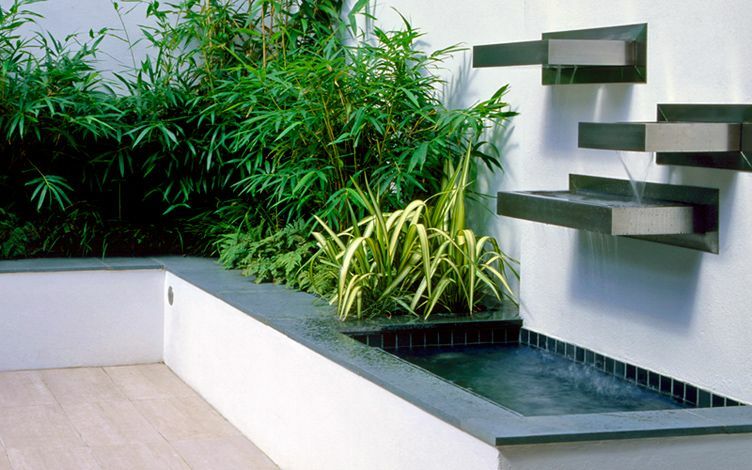 Build features: granite waterfall, artificial grass, floating raised beds with a recessed coping detail, multi-tiered curved planting bed, subtropical foliage. How small? 24sqm. City location: London SW6. 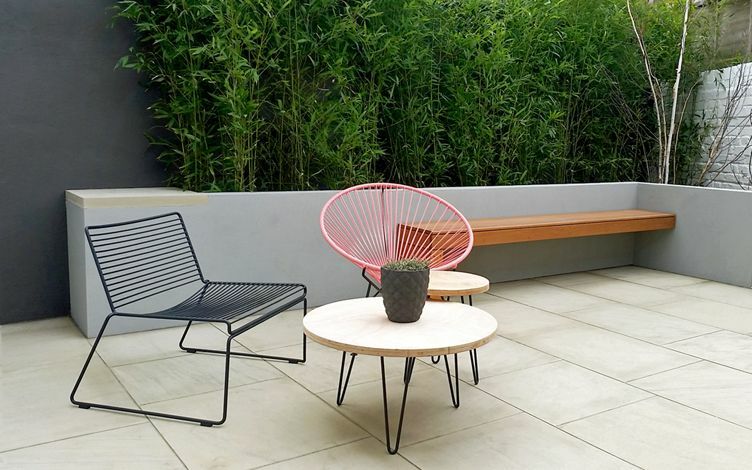 Garden: terraced townhouse bordering South Park with a roof terrace and balcony. Design elements: stainless steel detailing, including a three-tiered waterfall, bespoke tapered vases and recessed light fittings. Build features: L-shaped raised bed, slate coping, European oak handrails, porcelain tiled patio, Cedar screens, Japanese woodland planting. How small? 62sqm. City location: London SW9. 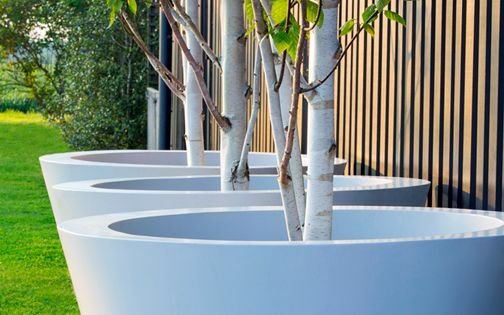 Garden: elongated, north-east facing with mature trees. 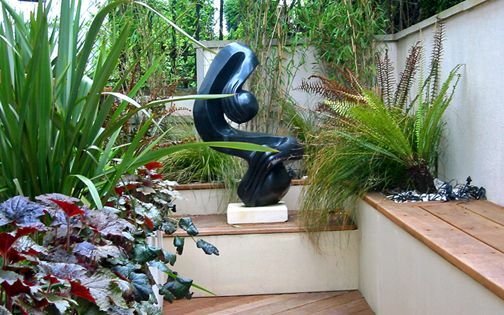 Design elements: central split-level deck, subtropical planting scheme, hedging, floating benches. Build features: porcelain tiles, raised beds, privacy screens, outdoor cooking area, multilevel stairways, irrigation, lighting, front garden. How small? 40sqm. City location: London NW3. Garden: end-of-terrace, south-west facing plot. 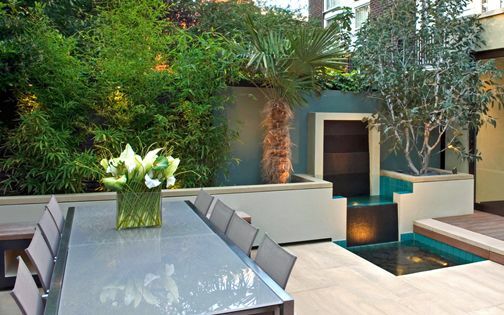 Design elements: waterfall pool with fountains and a floating Palm tree, deck and paving, raised beds, built-in seats. 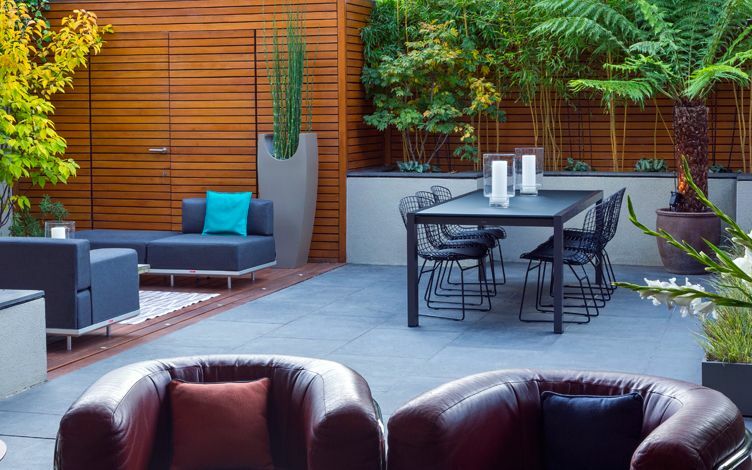 Build features: Ipe hardwood, grey limestone, wall rendering, exotic planting scheme, automatic irrigation and outdoor lighting. How small? 36sqm. City location: London SW6. 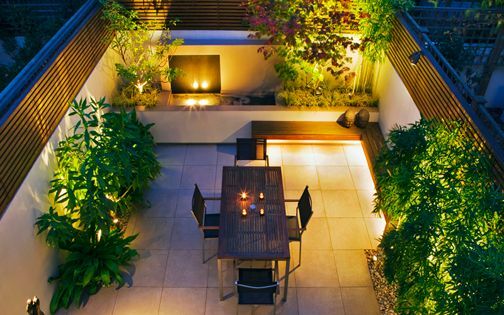 Garden: terraced townhouse, west-facing with a roof terrace. 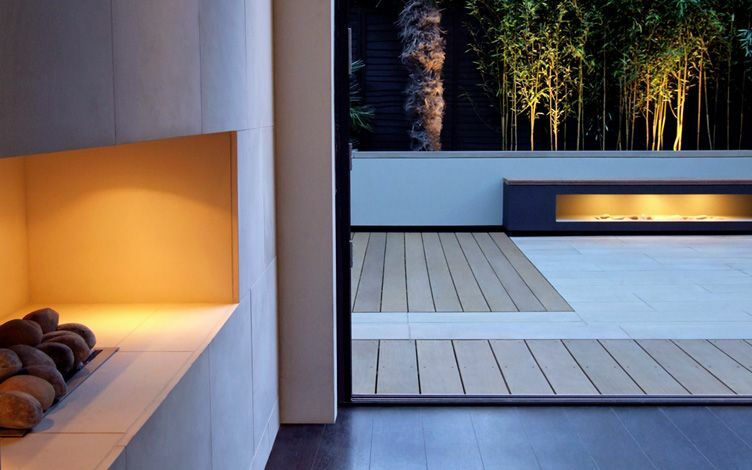 Design elements: indoor-outdoor porcelain tiled patio, Cedar-clad privacy screens, sculpture display, bespoke bench, granite waterfall and pool. 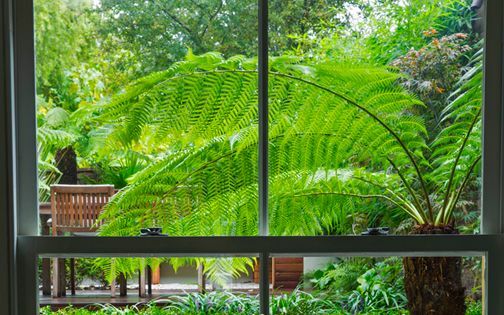 Build features: raised beds, hardwood deck, rendered walls, woodland flora. How small? 25sqm. City location: London N1. Garden: walled, terraced and squared. 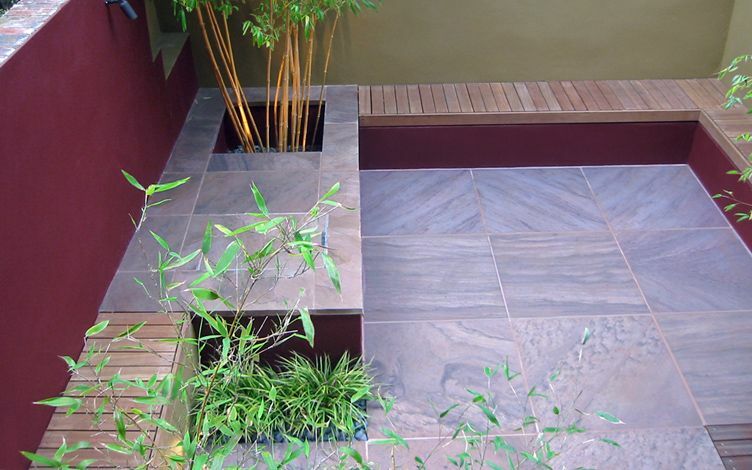 Design elements: large-scale lilac sandstone pavers, built-in seating, inverted raised bed, colour scheme. 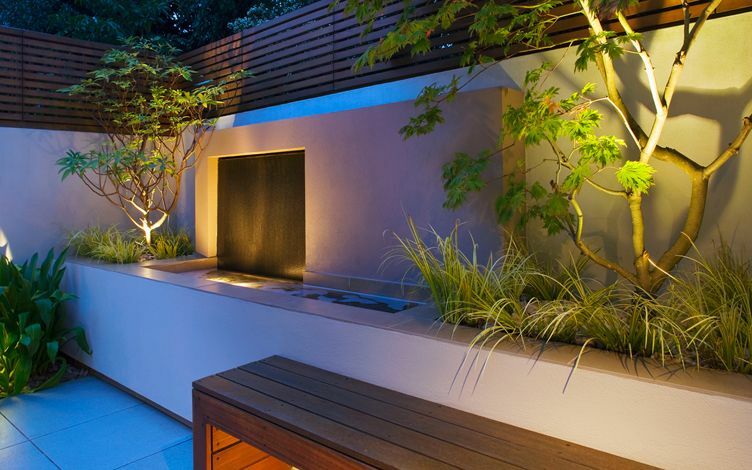 Build features: rendered walls, hardwood, bespoke lighting, heating, irrigation. How small? 27sqm. City location: London W4. 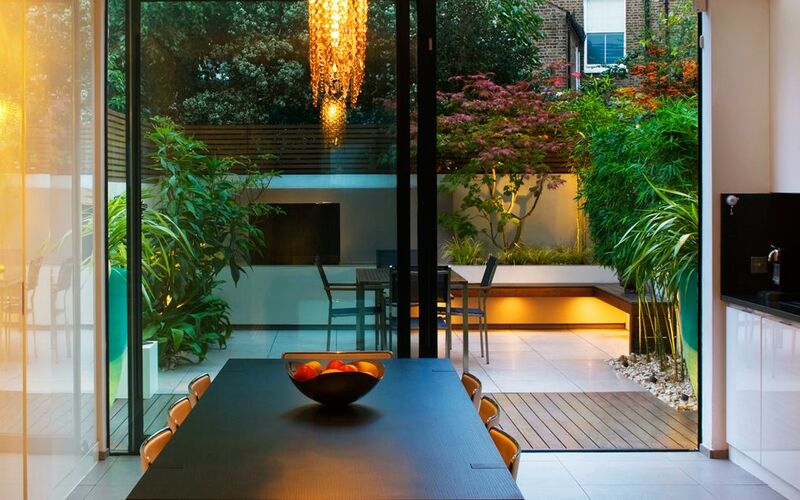 Garden: west-facing plot, modern townhouse extension. 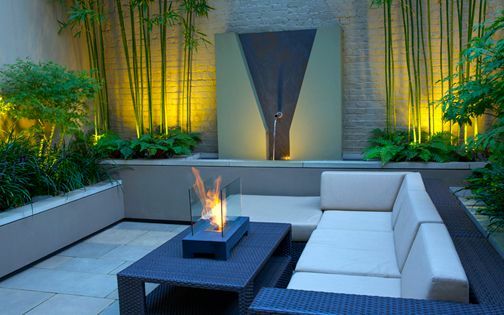 Design elements: custom-built seating, inverted circular tree bed, hardwood screens, architectural planting, natural stone, minimalist detailing. 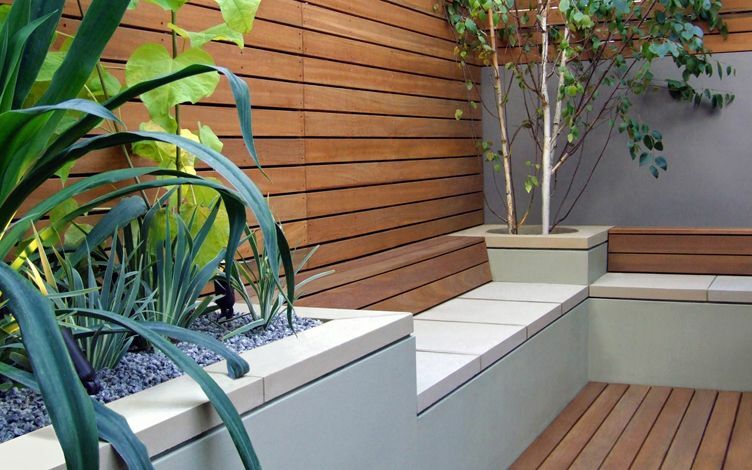 Build features: raised beds with recessed coping, rendered walls, colour scheme, heating, irrigation and remote-controlled outdoor lighting. How small? 33sqm. City location: London N1. Garden: triangular, south-facing plot. 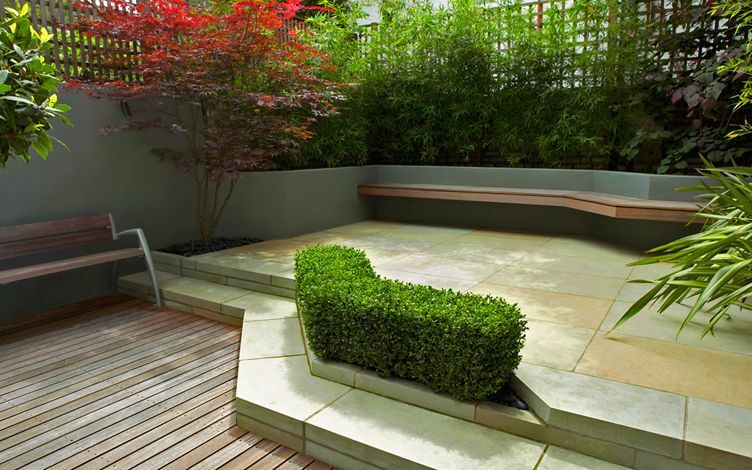 Design elements: natural stone and wood, floating bench, inverted L-shaped raised bed, green wall focal point. 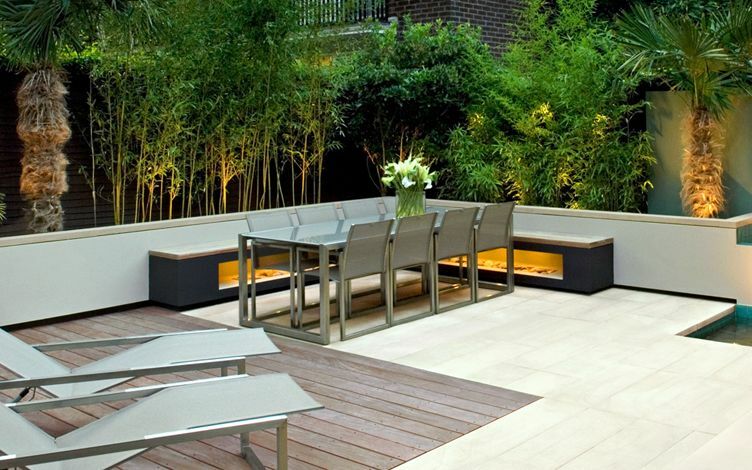 Build features: hardwood deck, seating, colour scheme, architectural planting. How small? 40sqm. City location: London N5. Garden: west-facing, end-of-terrace modern townhouse. 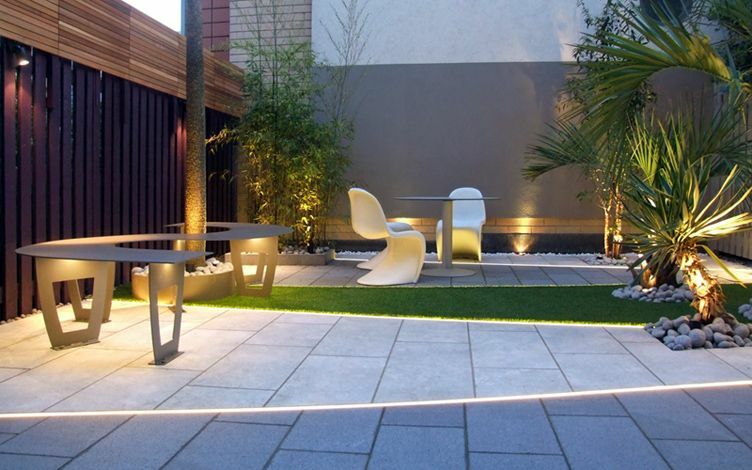 Design elements: limestone and flamed granite surfaces, LED strip lights detailing, curved steel bench, bespoke vases, artificial grass. 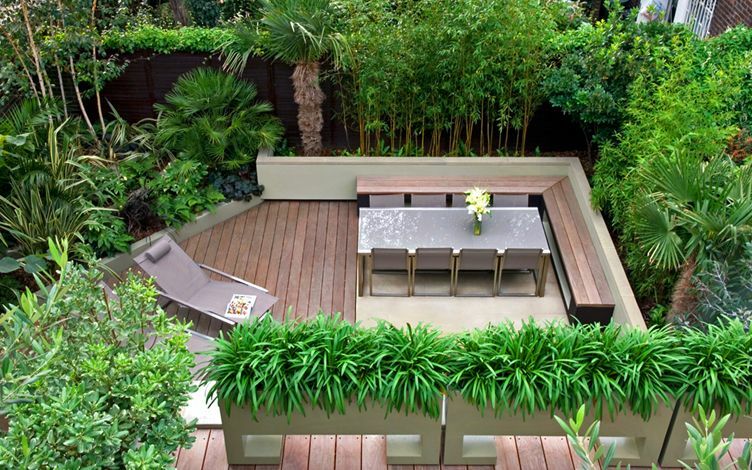 Build features: Cedar privacy screens, colour scheme, Palm trees, low maintenance planting, irrigation. How small? 50sqm. City location: London SW4. Garden: south-facing, square space, modern extension with a roof terrace. 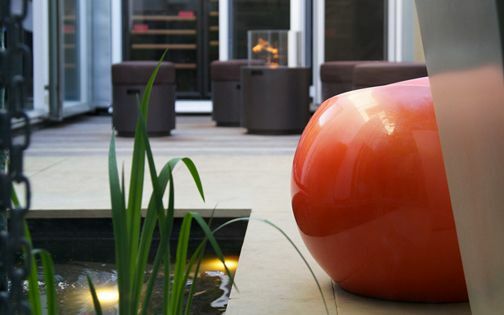 Design elements: outdoor fireplace and oven, multifunctional storage and bar, waterfall, sculpture wall, colour scheme, custom-made planters. 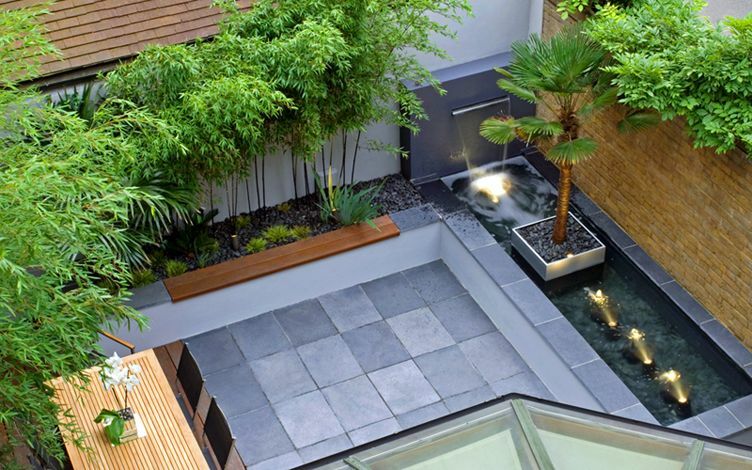 Build features: Cedar, basalt, hardwood, raised beds, architectural and water plants. How small? 35sqm. City location: London NW3. 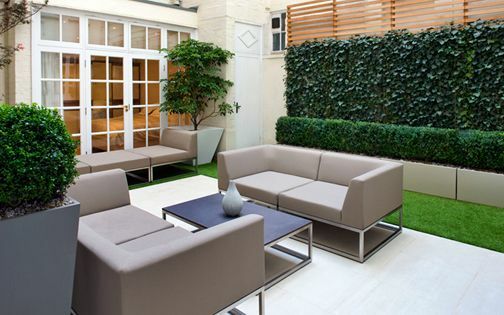 Garden: north-facing, mid-terrace, rectangular with a roof terrace and front garden. 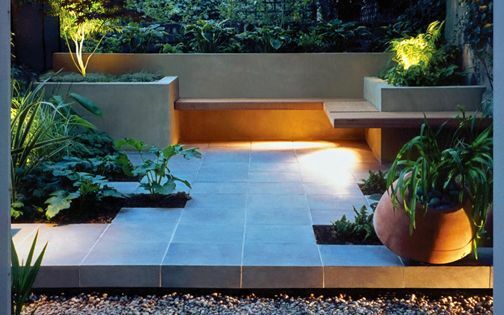 Design elements: cantilevered bench, inverted raised bed, sandstone patio, angular steps, hedging, woodland planting. 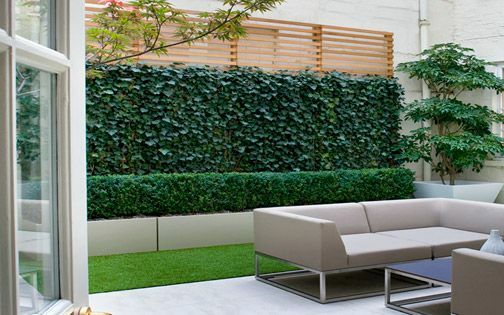 Build features: privacy screens, rendered walls, decking, paving, irrigation, lighting.